Brightness, patience and skilfulness – the positive meaning: we can admire the calm nature of spiders, when they are waiting for the prey in a web. The web is a complex structure, which demonstrates their intelligence and skill. Guile, craftiness and cruelty – the negative meaning: we are afraid of spiders, because some are dangerous to humans and almost all are hunters, who are maliciously waiting for someone to fall into a trap. And honestly, that is not really the sign of a “fair” fight. Mother or woman – in Greek mythology spiders originated from Arachne (read more below). Jung's “Shadow” – the least desirable and unconscious aspects of one's personality. Small insects represent something that often bothers us. When you see a spider, most striking is usually the inhumane appearance. Spiders anatomy briefly: they have eight legs, four pairs of eyes and they are unable to digest solid food (the digestion is carried out largely externally as you well know). In comparison to human they embody the ugly counterpart, similarly to snakes. That is certainly the reason, why Jung considers the spider in a dream as a symbol for the dark side of our personality, called the shadow. Spiders have the ability to weave a web. It is a creative potential but used for catching and prisoning of others. Such behaviour is not praiseworthy from our perspective, but spiders must feed somehow and, unfortunately, they are not able to grow the grain and bake the bread. When interpreting your dream, it can be enlightening to know more about the spider legends and beliefs, but crucial is your own relation to this creature. 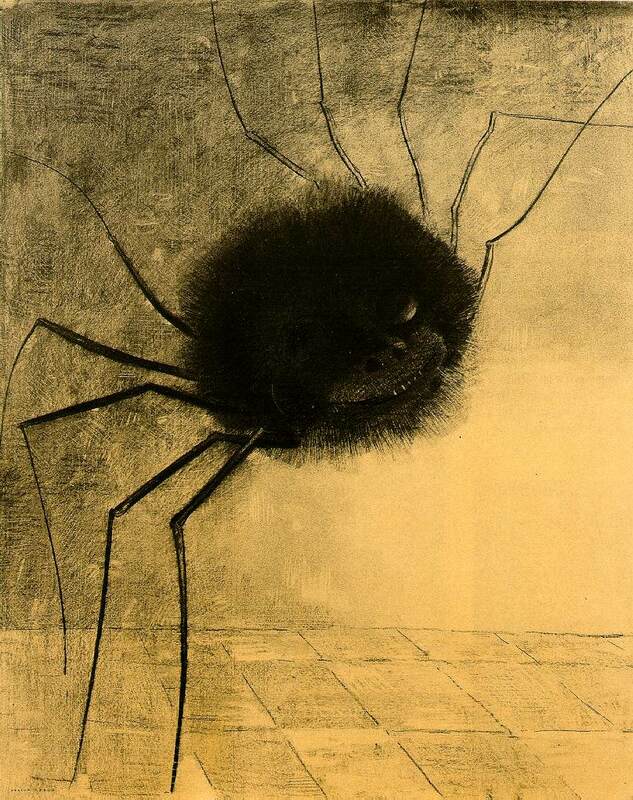 Please keep in mind that if you are very afraid of spiders, they can appear in your dream just for the simple reason – to train your mind, to slowly get used to them. You can interpret the web as the dense and complex relationships, in which you can easily get trapped. The web can indicate also the rules and restrictions, that limit your freedom. The spider in such web can be your mother or sometimes the father, your boss or other leading figure. The cobweb makes the space veiled and impenetrable. It symbolize different obstacles and traps you encounter in your life. When you are cleaning (removing) the webs in your dream, it resembles the process of liberation – you probably would like to get rid of some restrictive connections or feelings. Fibres of web = links of complex relationship (family, romance ...). Entangled in a cobweb = feeling emotionaly trapped. Spiders can attack you, bite you on hand, on neck or even on your face. The aggressive behaviour is significant for your feelings of being really offended, insulted or deeply hurt by a person (probably the female one). The bite is not a common “touch” and therefore it symbolize the radical intervention in your life. You can dream of spiders crawling on you mostly in the case you feel threatened. Probably some people, tasks or events are annoying, disturbing or irritating you. The “crawling” is not so serious as the case of “biting” described above, thus the interpretation should be more gentle – you are bothered or shocked but not seriously harmed. 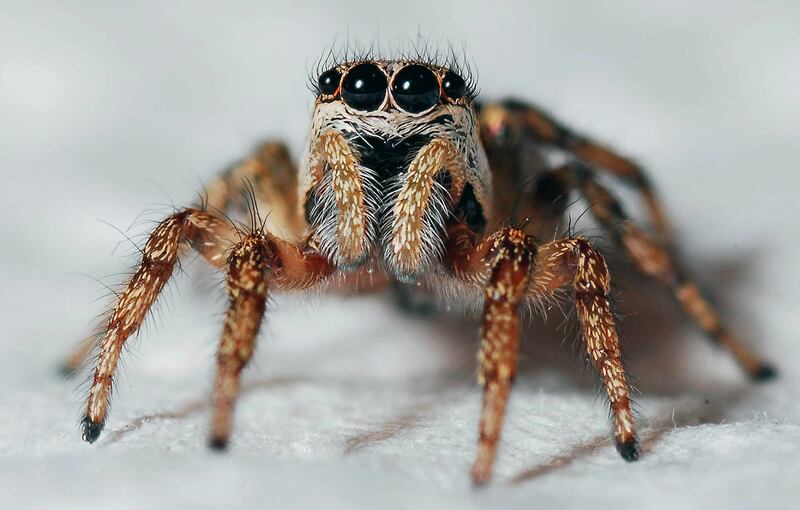 Spiders in your hair represent the genuine problem, especially if you have long and curly hair and it is hard to get rid of the spiders easily. Your hair is a very apparent sign of your health and state of mind – a hair loss is often the evidence of a serious illness, the cancer, and when you have a bad temper you usually do not care about your hair and the overall appearance. When you dream of spiders crawling in your hair, it can be interpreted as your fear that someone or something (thoughts, events) is ruining your good mood or appearance. Your bed is the very intimate space. You can expect to encounter spiders in the nature, but usually not in your bed. A spider in your bed is symbolic for the radical violation of privacy. You are unconscious while sleeping and not able to fully defend yourself at this time. When you find spiders in your bed, it means that somebody invaded your privacy. It can be a real person, but you can also interpret it as your own negative and annoying thoughts or feelings towards others. When spiders are laying eggs, it is clear they will soon hatch and multiply. Eggs are the sign of increasing numbers of this creatures – symbolic also for rising problems or troubles becoming more intense. But the egg is just a “presage”, the indication of future potential. You still have time to do something to stop the annoying and unwanted development in your life. Killing a spider is a way how to handle problems which this arthropod represents. But there are many other and more convenient solutions. If there is no life-threatening danger like a giant tarantula from a horror movie, a jumping and venomous spider or a heavy gold robotic spider-like machine rushing on you, you should avoid the violence and look for peaceful solution. “Live and let live” is the best way how to handle problems, if possible. In Greek mythology spider is bound with the arrogant female principle. Arachne (after her arachnophobia as the fear of spiders) was a brilliant weaver who challenged Athena, the goddess of wisdom, into a weaving contest. Arachne was than transformed into a spider as a punishment. This myth is also an explanation for the spider's creation itself. Shelob is a fictional giant spider, an “evil thing in spider form”, from The Lord of the Rings. But in modern culture you can find also male and positive examples as is the Spider-Man. The mythology about spiders is often contradictory in its meaning. Therefore you have to decide, whether your spider is rather female or male figure and whether it carries the positive or negative meaning. To take a look on spider paintings or sculptures can be very helpful for finding the inspiration when exploring and interpreting your dream.